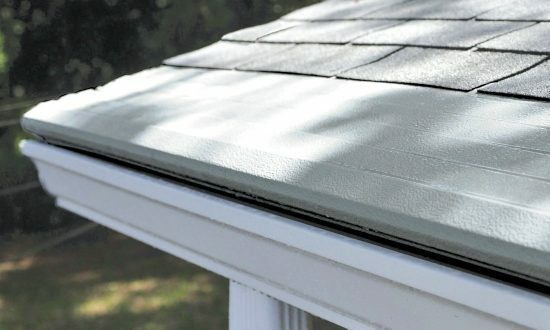 Gutter covers (also known as gutter caps or guards) play a vital role in protecting your gutters from clogs and your home from water damage. They reduce or eliminate the need to muck out your gutters manually, keeping you off the ladder and out of the hospital. Gutter covers can be found at any home improvement or hardware store. The simplest are made of mesh and are installed over rain gutters using tape or screws to filter out debris and allow water to pass through. Because debris tends to collect on screens, these gutter covers still require maintenance and are not a permanent solution. Other gutter covers are made of perforated metal or vinyl panels. They allow most debris to slide off the top surface while water trickles down into the gutter. While better than screens, these are not maintenance-free either. Purchasing and installing your own gutter covers may sound cheap, but the reality is that they do not last as long and are not as effective as professionally-installed gutter covers. The best gutter covers are installed by trained and factory-certified contractors. These systems have a huge edge over their DIY counterparts in that they are more durable, perform better and are covered by more robust warranties. Although the initial cost is higher, the long-term benefits and savings are well worth the investment. At Gutter Helmet®, we offer professionally-installed gutter covers backed by an unbeatable Triple Lifetime Warranty and a guarantee that you’ll Never Clean Your Gutters Again®. Our gutter covers have a patented nose-forward design that uses surface tension to draw rainwater into the gutter channel. Gutter Helmet has a narrow 3/8” opening that lets leaves and other debris fall harmlessly to the ground without ever getting in the way of the flow of water. Gutter Helmet is rated to handle rainwater at 22 inches per hour, more than twice the amount of rainfall ever reported in the United States. Our system works, and millions of homeowners have proven it. That’s why we’ve been America’s #1 choice in gutter protection for over 35 years! Talk to your local Gutter Helmet dealer to see for yourself why Gutter Helmet is the best-selling gutter protection brand in the U.S. Call us today at (800) 824-3772 or fill out the form to receive a free, no-obligation estimate. Is Installing Custom Gutters Right for Your Home?